Set up takes only minutes and operation could not be easier. The heavy duty fountain maintains chocolate at an ideal temperature (approx 105-110°). Precision stainless steel auger circulates the warm chocolate up through the fountain and back down over the stainless steel tiers. The upper tier unit and auger disassembles for easy cleaning. Simply remove the top cap, stainless steel auger, outer tube and tiers, then place in the dishwasher for easy cleaning and sterilization. 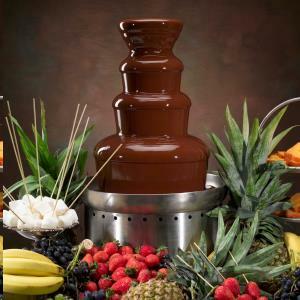 * Please call us for any questions on our chocolate fountain large rentals in Eastlake OH.